Taking its name from the only single to be released from The Clash’s final, hideously vulgarised LP Cut The Crap (by manager Bernard Rhodes, who synth-popped each of the 12 tracks to within an inch of their lives), Shane Meadows’ new film is about what happens when fundamentally decent belief systems get reinterpreted by morons. It’s 1983 in a grim north of England coastal town. Four years of Thatcherism have seen the rich get richer on freer market economies while the poor and disenfranchised have spent eight days of July 1981 in a state of unrest fuelled by racial and social discord, rioting in nearly every major British city (including Edinburgh). At that time, as a diversionary tactic, the Conservative government had entered our forces into a war with the Argentineans over a slab of rock that no one really knew we owned. The Falklands War, as it came to be known, was to secure the Conservatives their second term in government as it, along with the Royal Wedding of Charles and Diana began to reignite a sense of patriotism amongst the middle classes. Somewhere in this fractured world is Shaun (Thomas Turgoose), a lonely 12-year-old boy who is growing up in a new town after just finding that his father has been killed in the Falklands. Soon after he is befriended by a bunch of older skinheads and suedeheads (the old fashioned reggae and ska loving kind) led by the amiable Woody (Joseph Gilgun). The group takes him under their wing, and for a while all is rosy, but then one of Woody’s old friends Combo (Stephen Graham) gets out of prison and he has different ideas about where the British white skinhead should stand in a time of war. Meadows very simple, hugely autobiographical morality tale is clearly going to be marred by the ridiculous rating that the BBFC have stuck on it (which means that kids the same age as Shaun will be unable to see it), but as it stands this is arguably this great English filmmaker’s finest film to date. Beautifully characterised and realised, there is so much familiar here to anyone whose formative years were spent under Thatcher’s first two terms in office. Though never a filmmaker to imitate, Meadows is obviously working to a few period filmic benchmarks here, noticeably Ted Befaloukos’ great 1978 Jamaican musical Rockers (a huge influence on UK skinheads when it finally reached these shores in 1980) and Franco Rosso’s shamefully overlooked 1980 Brixton youth drama Babylon, and of course Mike Leigh’s remarkable essay of high rise disintegration in a time of unemployment - Meantime. 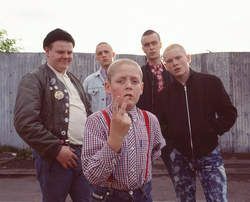 Despite superb performances from all involved, a great soundtrack and near seamless production design, This is England does begin to run out of steam in its last third as the predictable looms, but still this is powerful, low budget British cinema from a major talent. Selected release from Fri 27 Apr.